On my way to Divisoria this morning, I was thinking about where to buy a football jersey in Divisoria. I remembered buying one, the England jersey which they used in the 2002 WOrld Cup, in 168 Shopping Mall. I was trying to remember again where I could buy the football jersey in 168 Mall, Divisoria. I had to walk around the 1st building of 168, the one closest to Tutuban Mall, and their second building. 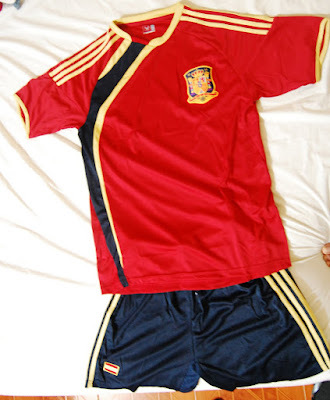 I eventually found the two shops that sell football jerseys and got me an Spain replica jersey set for P400 (almost $10). They sell the shirt for P350 and the shorts for P100 but you get them cheaper when you buy them as a set. They also have shirts with print, if you want a jersey with the number and name of your favorite football player, for the international league, premiere league and even the LA Galaxy jersey. The first shop I went to was located at the second floor of the second building of 168 mall, right beside the escalator. the second one, where I used to buy jerseys and where I got my new one, was at the first floor of the first building. I hope this post helps those who are looking for a shop where they could buy replica football jerseys in Divisoria. Hi. Do you know if they still sell football jerseys out there in Divisoria? Thanks. Hi! Do you know if they still sell football jerseys out there in Divi? Thanks. Hi. Are they also selling Futsal shoes?